Norwegian Cruise Line reports that Norwegian Star has arrived in Melbourne under tow and is safely alongside. The ship never lost electrical power, and all hotel services continue to operate normally. An assessment team is checking the propulsion system, and the line says they should have a repair time line and expected departure time available within 24-48 hours. Passengers are invited to remain aboard, or they may disembark and return to Sydney. Passengers were already given full refunds, onboard credits, and future cruise credits. Last summer we told you that Carnival was breaking ground in the fall of 2017 by scheduling a two-week round trip cruise from Southern California (Long Beach) to Alaska. Demand was so strong that seven months before the first passenger goes up the gangway, they have scheduled another similar program for late in the summer of 2018. Next time they will be sending Carnival Splendor on the two-week trip which will sail from Long Beach on August 25, 2018. A crew member was killed Thursday aboard Emerald Princess while it was docked at Dunedin (NZ). The 33-year-old Filipino man was working on deck servicing a gas canister connected to the hydraulic launching system on a life boat when the canister exploded. The show will be presented in the 1,340-seat Walt Disney Theater, and Disney will use their magic, as usual, to draw in every age group, and everyone will enjoy it on their own level. Yesterday we told you how technicians were aboard Norwegian Star repairing its nonworking port Azipod as it sailed its modified itinerary, and the plan was to have it all repaired by the end of this cruise. But then almost as soon as the story went out, it was almost like Neptune rose up from the sea and said, “Not so fast, NCL!” And he put up his mighty hands and the propellers on Norwegian Star's Azipods just stopped turning. But there was plenty of power for those onboard. Hotel services are all still fully functional, and at last check, everything's going along just fine onboard. Holland America has partnered with O, the Oprah Magazine for an exclusive relationship that will be kicked off by Oprah and Gayle (King, her best friend and editor at large of the magazine, but Oprah fans knew that) aboard Eurodam as they sail to Alaska in July. It all ties in with Oprah's Year of Adventure. Last month when Carnival released Carnival Horizon's inaugural programs for 2018, there were holes in the schedule once the ship got to New York in late May. Carnival said those sailings would be detailed in the near future. The future has arrived. Carnival had a surprise. If Carnival had followed their past MO, there would have been four-night trips scheduled to the Canadian Maritimes. Not in 2018. Get out your shorts, because in 2018, Carnival is sailing from New York to Bermuda. When last we checked in, Norwegian Star was puttering along, more slowly than normal, on one Azipod Down Under. Norwegian and ABB, the manufacturer, were pondering solutions as the ship sailed toward its turnaround last Monday in Sydney. The ship set off from Sydney Monday afternoon on its modified 12-night itinerary to Auckland, and a repair plan is now in place. Norwegian Cruise Line has received approval for 25 additional calls at Havana though the end of the year. That allows the line to extend their four-night cruises from Miami to Havana that begin in May, to weekly cruises through December. A Canadian woman continuing to be held in the Bahamas for more than a month after her cruise. 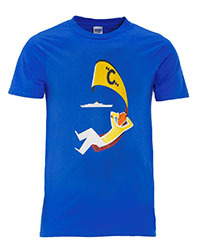 You can almost hear Karen Carpenter singing it as you browse the onboard shops aboard Costa ships these days because much of the logo merchandise recalls Costa's past. Called Vintage Costa, the collection features historic graphics and logos of Costa from the '50's, '60's and '70's on everything from T-shirts and hoodies to key rings and bags. Cruisers will want to keep their eye out for a couple of notable things coming down your cable. 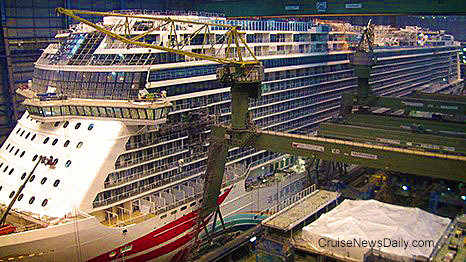 A quick peek into the covered building dock today at Meyer Werft at Papenburg shows that Norwegian Joy is nearing completion, as it should be. Meyer has tentatively scheduled float out for just about a month from now, and that means its trip down the Ems River is within a month after that.